Golfers elbow occurs on the inner side of the elbow. Golfers elbow, also called medial epicondylitis, affects more than just those who love to golf. Though this condition is most commonly found in individuals over the age of 35, it can affect anyone who repeatedly puts stress on the wrist and fingers. Unlike tennis elbow which affects the outside of the elbow, those with golfers elbow experience pain on the inner side of the elbow. This condition can affect the elbow’s normal range of motion and can cause further complications if left untreated. The most common symptom of golfers elbow is pain and tenderness on the inner side of the elbow, sometimes extending down to the inner side of the forearm. This elbow pain can appear suddenly or gradually and tends to worsen as you flex your wrist or clench your hands. Golfers elbow may cause stiffness in the elbow or weakness in the hands and wrists. Many people also experience tingling or numbness in the fingers. What are the causes of golfers elbow? Golfers elbow occurs when the muscles and tendons that control the wrist and fingers become damaged. This damage results from excess or repetitive stress on the wrist and fingers. This condition is commonly found in those who actively play golf and racket sports, as well as sports that involve throwing such as football and baseball. Improper lifting and any activity that requires you to repeatedly bend and straighten the elbow can also cause golfers elbow. What are the treatments for golfers elbow? 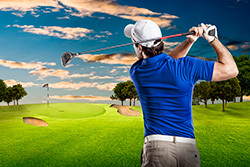 Golfers elbow and other sports injuries shouldn’t keep you away from the activities that you love. If you’re experiencing pain in your elbow or have symptoms that are consistent with this condition, consult with a sports medicine doctor for diagnosis and treatment. The sooner that you seek treatment, the sooner you’ll be able to get back to your daily routine. If you are looking for a natural, drug-free approach to healing golfers elbow sports medicine is the answer. Dr. Bob Meyer here at Spinal Rehab and Sports Medicine has over 21 years of experience in the field and can get you on a sports injury treatment plan that will get you back to doing what you love most, fast.